Breakspear School in Ickenham, donated money to Brain Trust School in Kamwezi, Rukiga for the purchase of some well needed resources. This will make a huge difference to the children in Rukiga. 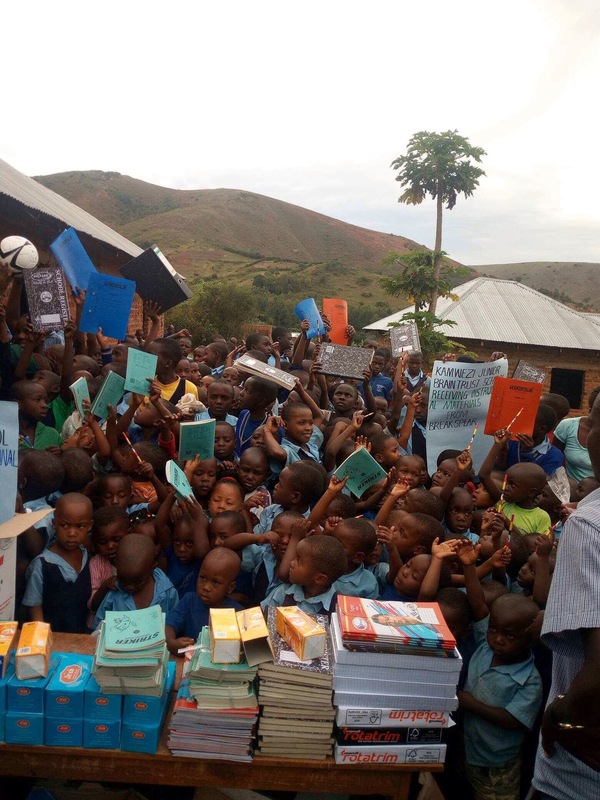 "The students and staff of the Brain Trust school of Kamwezi, wish to send their appreciation to the staff, parents and students of Breakspear School for thier continued support and gifts of instructional materials which they have given to the children of Brain Trust School this year. God bless you all" . 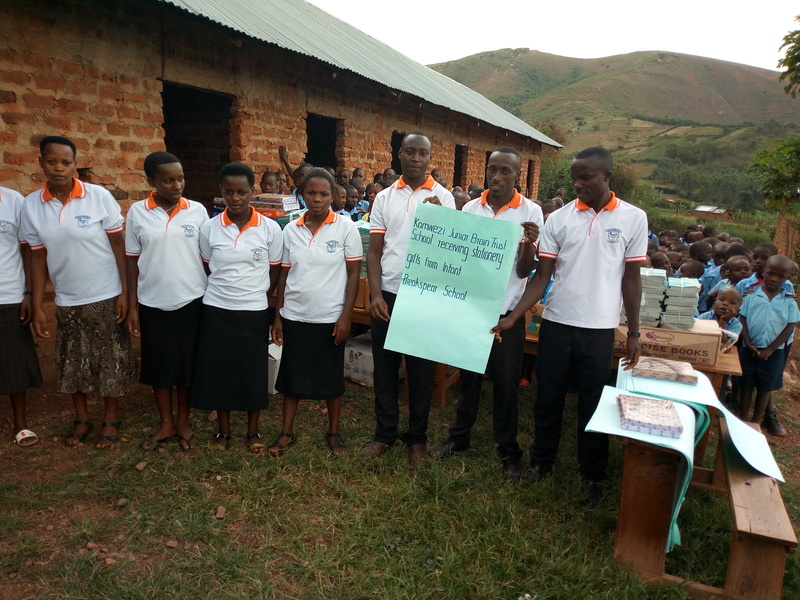 "We are grateful for the support you are giving our learners especially those supported by the CLICK Rukiga programme. The children have improved academically and can speak some English. Extend our gratitude to all". Thank you Breakspear School for your continuing support! 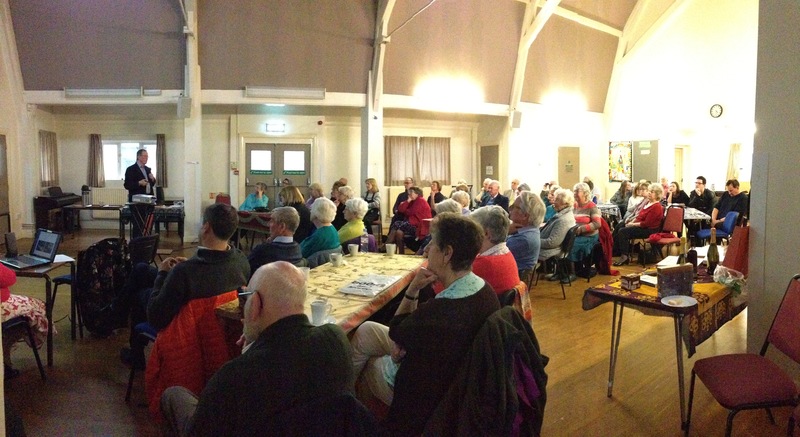 The presentation of the November visit took place on Sunday 3rd March 2019 in the afternoon, in St Giles Church Hall. The seven members who had gone to Uganda told compelling stories through beautiful photoraphs about their visit. 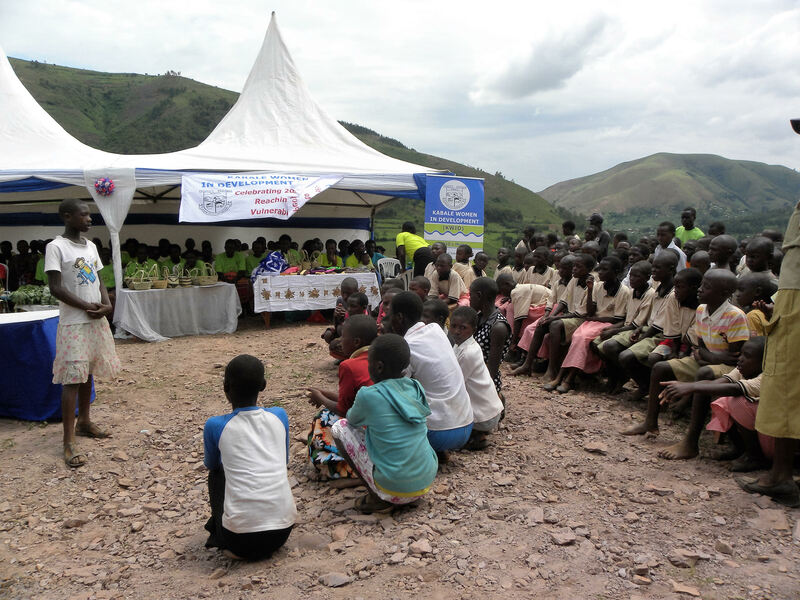 The presentation helped CLICK Rukiga reach a new audience, engaged existing donors through the question and answer session while raising awareness of the ongoing work in Rukiga. 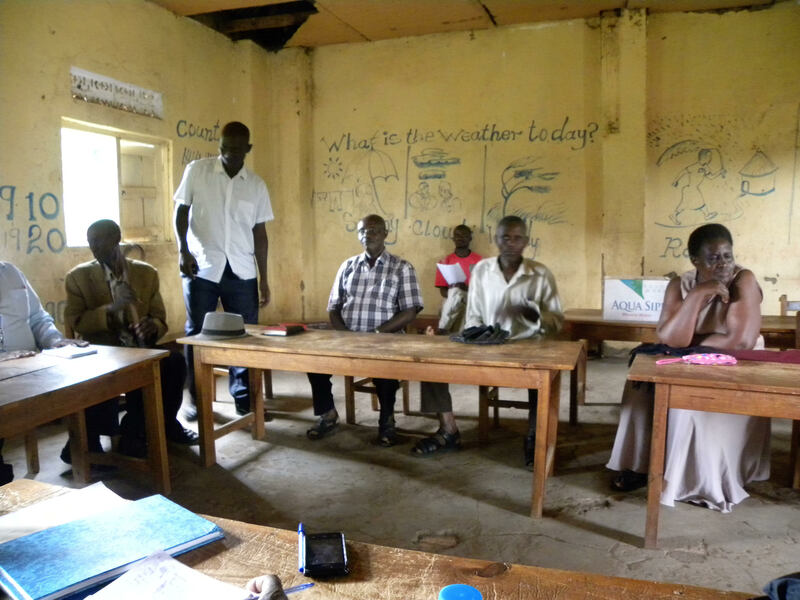 November saw another visit to the Click Rukiga Programme, our ongoing working link between the community in Ickenham and a community in Rukiga, South West Uganda. 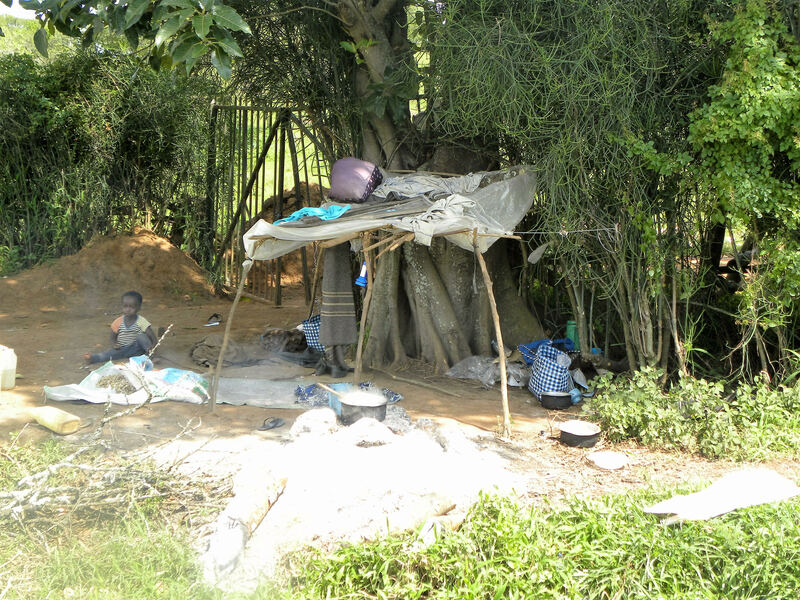 The area is quite poor, bordering the country of Rwanda. 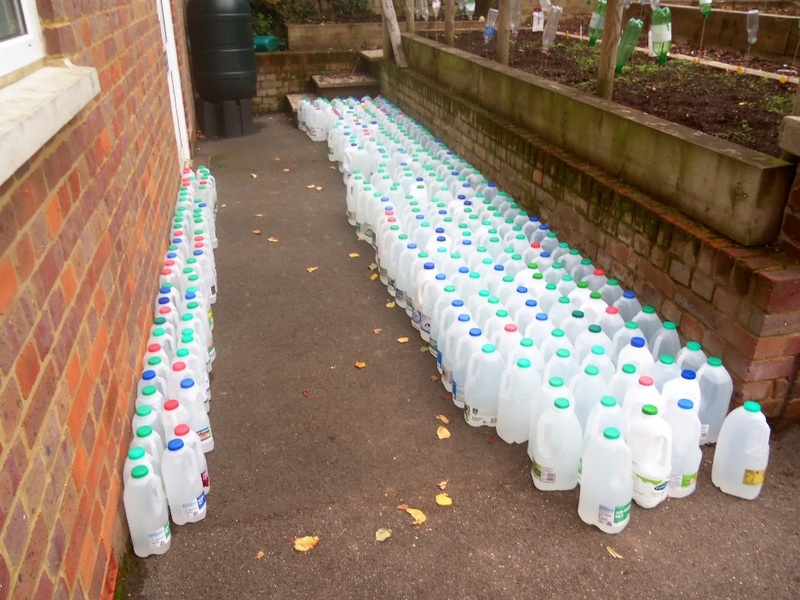 Fourty six families in Ickenham sponsor a child and their family. 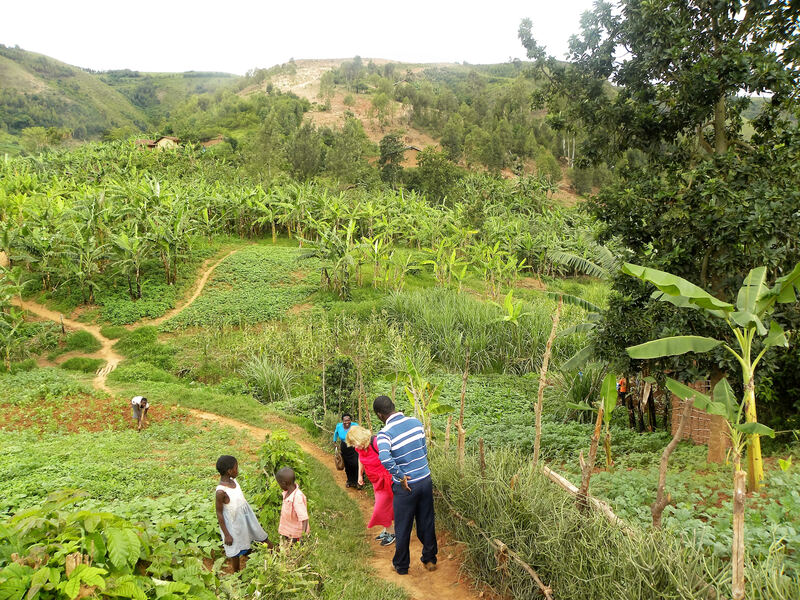 Our community supports a range of work, including a youth programme, helping young people to be trained for work, as well as Kabale women in Development, who empower women and children who are in need, to become self-sustaining adults. 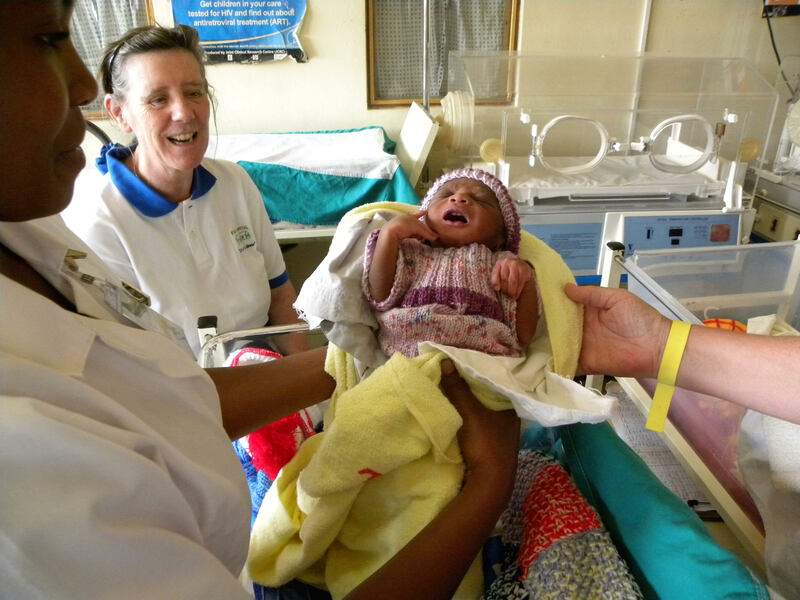 The staff at Kisizi hospital have put on garments knitted specially by Margot Barnikel! Seven team members paid a visit in November and the main purpose of the visit was to ensure that the funds we have sent to Uganda are being used by their community for the purposes we expect. We also wanted to check what their priorities would be for the next five years. The visit where everyone who went paid for their own flights and accommodation, was an enjoyable and fulfilling event. 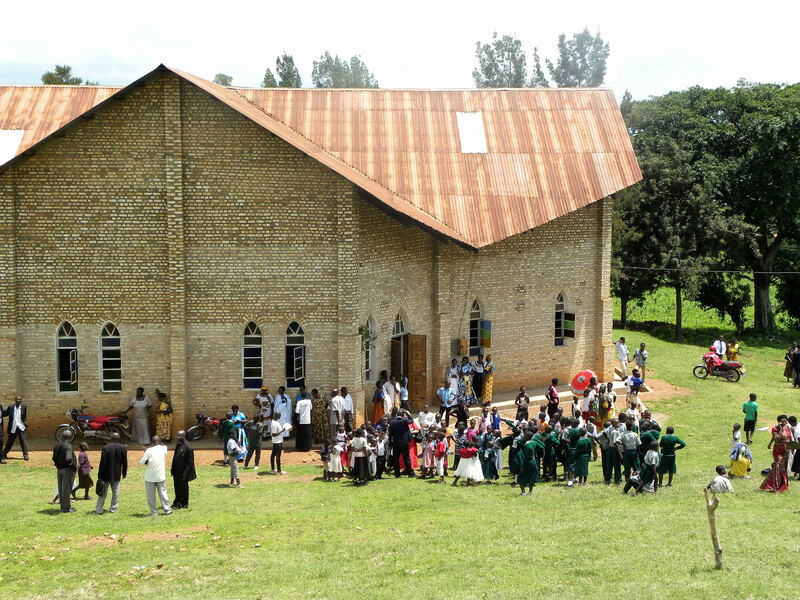 Breakspear School and Vyners are also linked to schools in the Rukiga area, and there is a strong link between St Giles' Church, the URC and St James Church in Kamwezi, Rukiga. Edwin Lee preached at the Sunday Service we attended and his words were interpreted into the local language by a local Priest. There were over seven hundred and fifty people in the service, which went really well. The CLICK Rukiga programme will continue to run for many years. There have been a number of suggestions for possible future help and the coordinating committee will meet in the coming weeks to decide how we can help in the future. There will also be further opportunities for members of our communities to visit in the future. 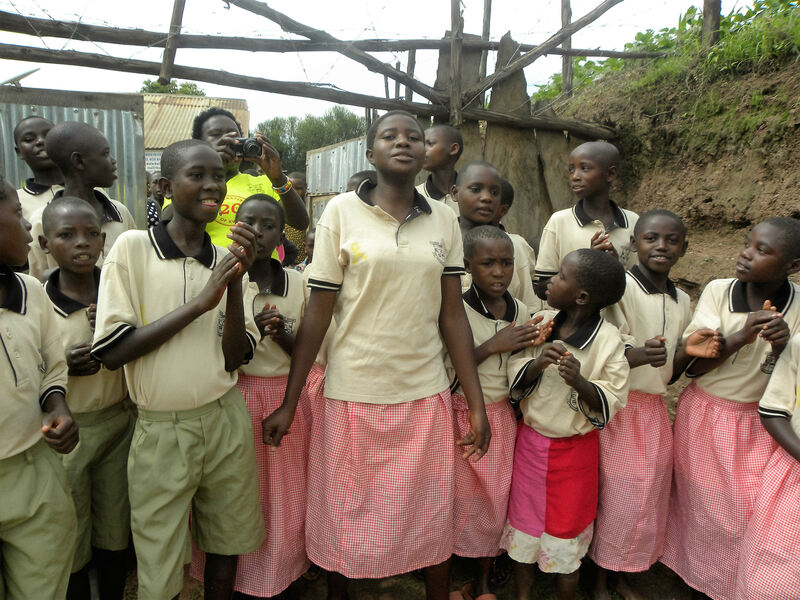 Carol Singing at Christmas time is an amazing way to spread the festive cheer and raise money for children in Uganda. 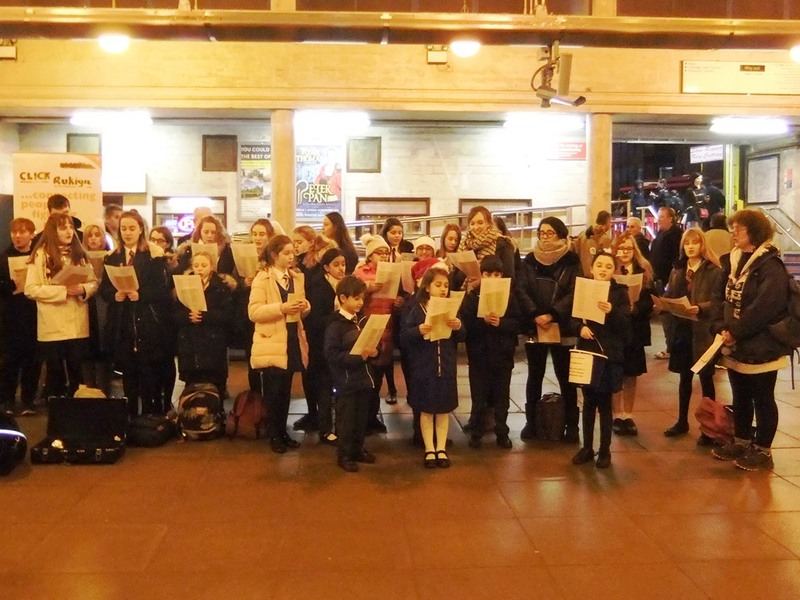 On Tuesday, 4th December, during the cool, crisp, night air of Uxbridge Station, we sang our hearts out, joined by teachers and children of Breakspear Primary School, Viners School and masterfully accompanied by the Brass quintet of Viners School. The commuters not only stopped and listened to us singing but joined in where they could. We were also asked for requests and a few encores ensued as a result. 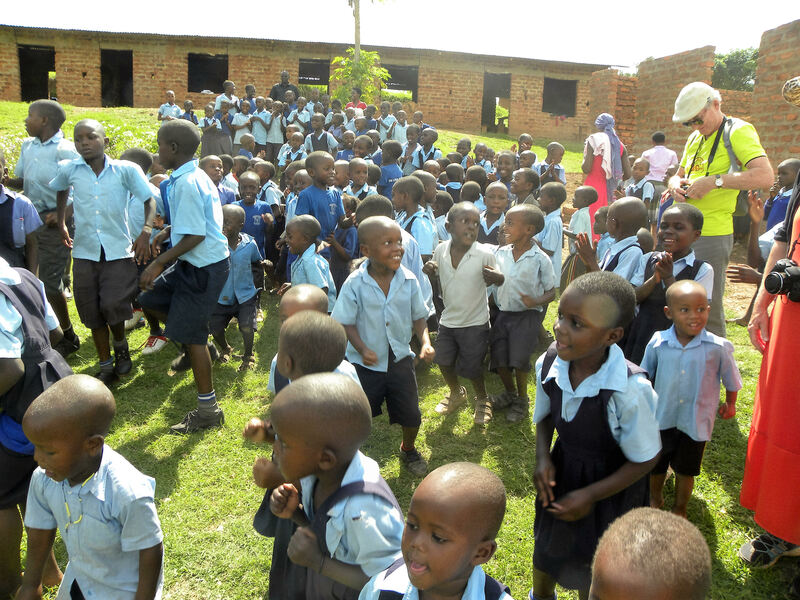 Singing and hearing carols made the start to the festive season magical, brightening up everyones December especially the children in Rukiga. Over £600 was raised through the commuters generosity. This will buy the community in Uganda twenty solaCr panels, or complete the fitting out of four classrooms for the local school. Many thanks to Dan Cullum and Aoife Coyle from Viners School for the musicians and choir and to Emily Beale and Rachel Quinn for the Breakspear choir. A big thank you to all who made this possible. 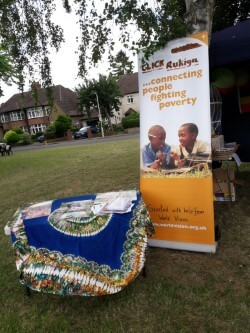 During the Ickenham Festival which took place during the second week of June, CLICK Rukiga had an opportunity to present its interests to the people of Ickenham. 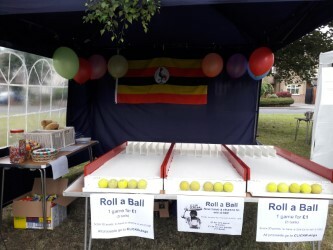 There was a stand at the festival displaying various leaflets with information about our work in Uganda together with roll a ball game inside the tent to help raise funds for the charity. 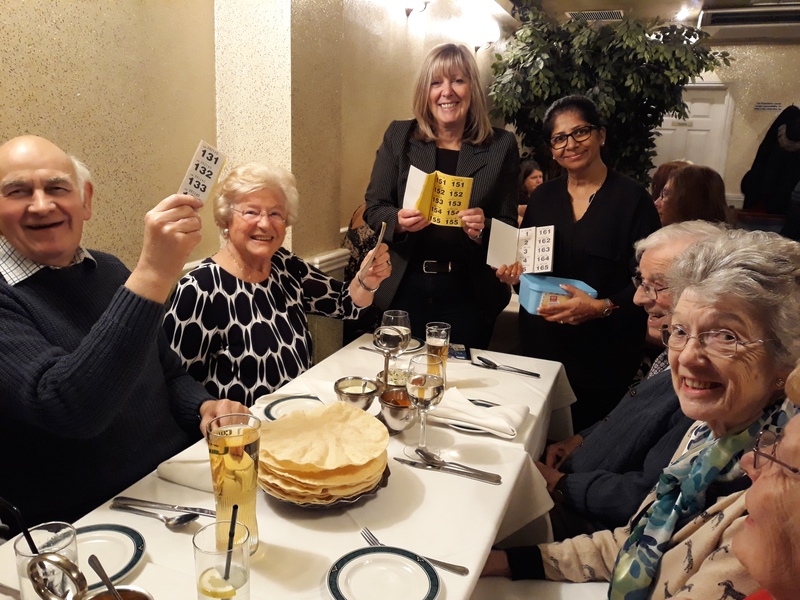 Our annual dinner at birothi Restaurant in Ickenham, took place on April 17, 2018. 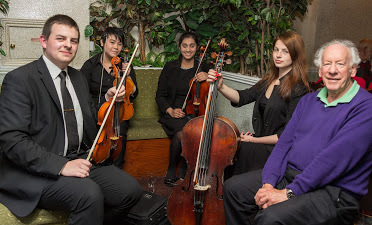 It is one of our more popular fund raising events where the guests enjoy a good meal and are also entertained by a string quartet. This year was no different. It was again a huge success. The event helped by two staff members from Barclays Bank raised an additional £170 from the sale of the Raffle tickets. Overall £686 was raised which Barclays have matched pound for pound. A huge thank you to Barclays Bank, Ickenham. 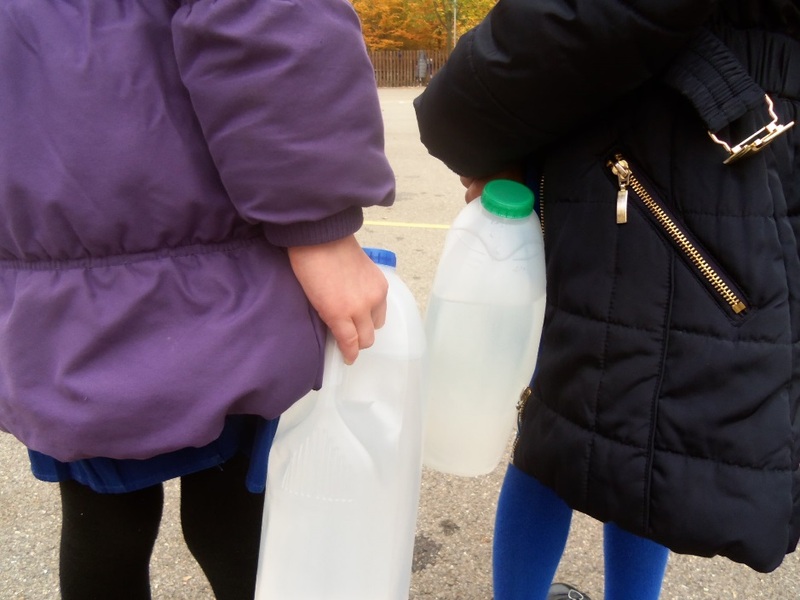 Breakspear School in Hillingdon raised £400 over the Christmas period from donations received from parents. This was sent to the children in Uganda. 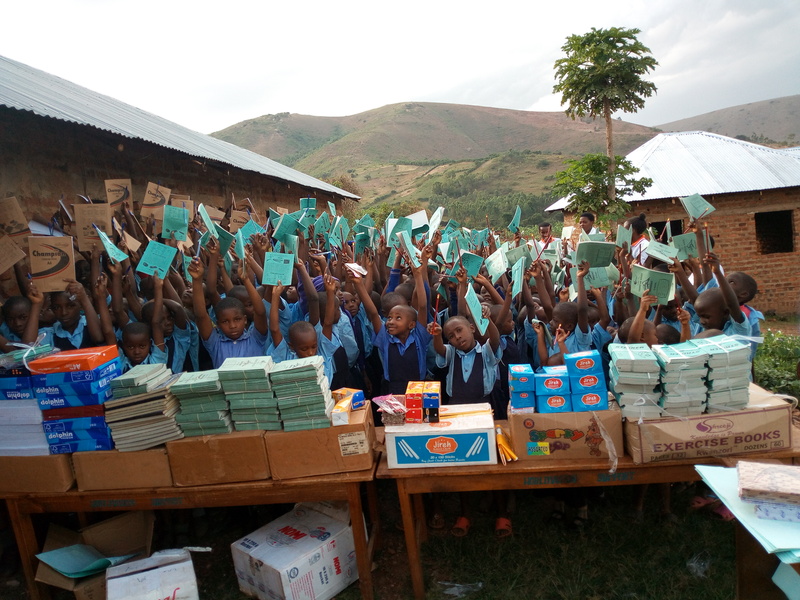 The money was spent buying textbooks and stationary for Kamwezi Braintrust School (Breakspear's partner school) in Uganda. Well done Breakspear School! at Uxbridge Station. The event brought the community together. Overwhelmingly, our supporters love to sing carols every year. Its touching to know that so many people are committed to making a difference to the lives of children at Christmas time and we appreciate the hard work that goes into organising the event. £530 was raised through the generosity of the commuters. Thank you! The rain held off for the Ickerman Barbecue held in the Rectory Garden on the 9th September 2017, in the afternoon. Everyone enjoyed themselves enormously. A lot of interest was shown for CLICK Rukiga's link with Rukiga in Uganda. Mike together with our team were on hand to answer any questions raised. The amount raised was £582, through the sale of the tickets to the barbecue as well as the jam that was sold on the day. Well done Ickerman, especially Tony and Felicity. A big thank you to Margot who made the jam and sold it at the event in aid of the CLICK Rukiga programme. Margot selling her delicious Jam! CLICK Rukiga in association with Hillingdon libraries presented an evening with Jeffrey Archer which was held on Wednesday, 28th June 2017. 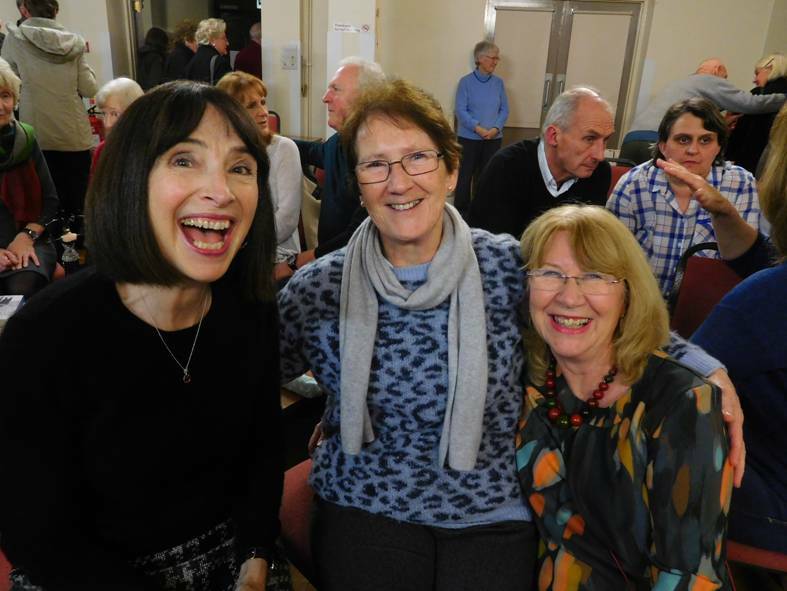 Best selling author Jeffrey, stood inside the Ickenham United Reform Church, packed with a 250 spellbound audience and told charming anecdotes, tossed off witticisms and bantered with the audience. It was liberally sprinkled with wry asides and dramatic pauses. It was a blend of theatre, stand-up comedy and story telling at its best. The question and answer session proved invaluable to the audience who asked questions relating to Jeffreys career in politics and specifically on his latest novel in the Clifton Chronicle series 'This was a Man'. The people in the audience appeared engrossed, perhaps becuase many were writers themselves. The questions were followed by an autograph session where Jeffrey sat in the hall in the corner, beside the church prayer room, where 40 or 50 fans lined up to meet him and have the books that they had purchased at the beginning of the evening autographed by him. Other audience members headed straight for the serving tables, where they helped themselves to wine and soft drinks which was included with the ticket price of £10. For avid fans this was a perfect opportunity to discreetly worship a famous writer and obtain the acute thrill of a face to face encounter. The event helped to raise £2156.10 for CLICK Rukiga. A huge thank you to the staff of Ickenham Library who helped in the sale and advertising of the event. An enjoyable evening was had by all including Jeffrey. 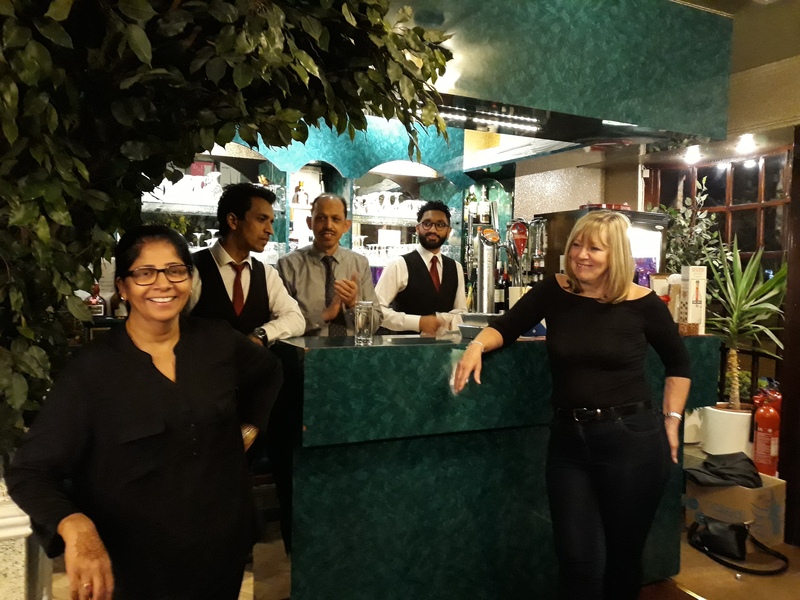 On 2nd May, Birothi Restaurant in Ickenham was filled with people having an enjoyable evening. The diners were enjoying a mouth-watering meal while listening to J Strings, the String Quartet from Hillingdon Music Service. Mr Khan provided his usual fantastic three - course meal, which everyone loved. 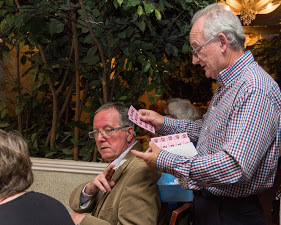 Some of the guests bought raffle tickets, which were selling fast and proving to be popular, while other guests gave donations. As a result £879.33 was raised for Rukiga, which Barclays Bank agreed to double. A couple of the Barclays team were also on hand helping in many ways. 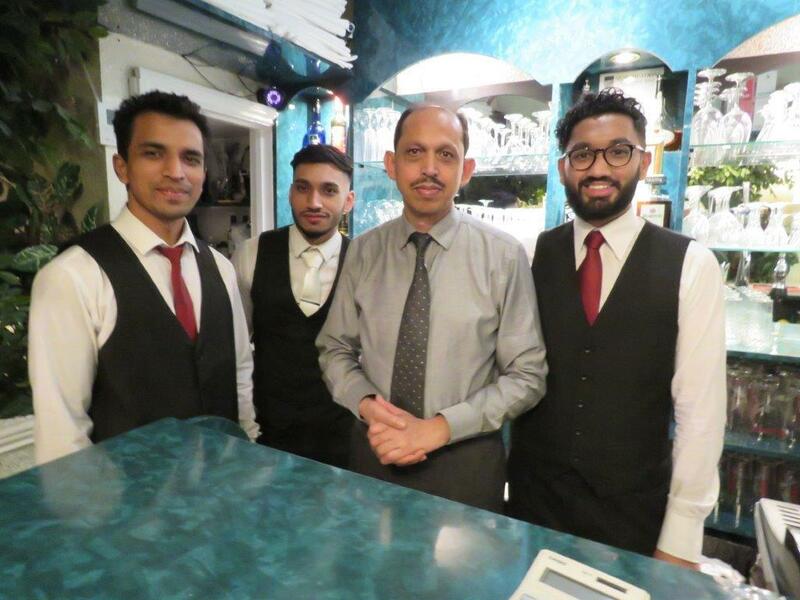 A huge thank you to Mr Khan for providing a delicious meal at a cost price and also to Barclays Bank for doubling the money that was raised. A successful evening was had by all which will help our friends in Rukiga, Uganda. In Emergency situations, CLICK Rukiga also covers community members hospital expenses and medical bills. 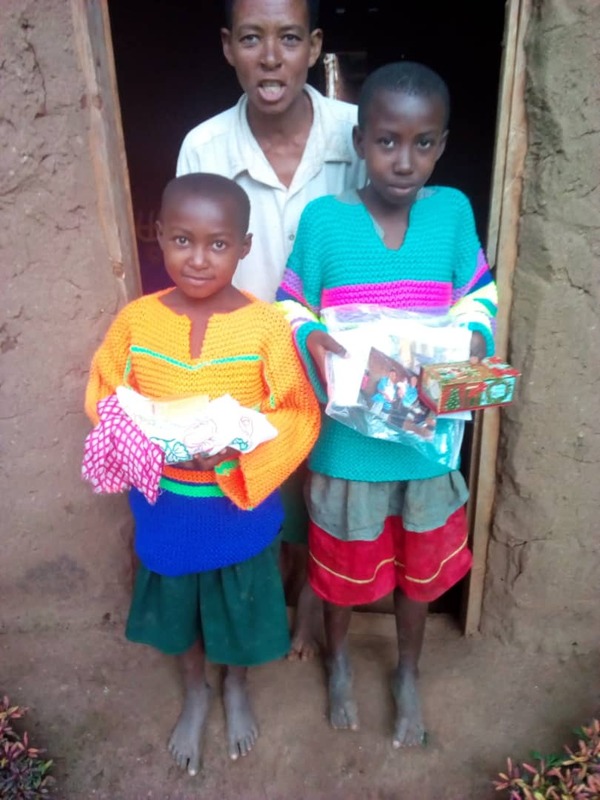 Pamela a valued member of the Rukiga community, was helped last week to visit Kabale hospital where she was referred for further treatment, from the Emergency Fund, to cater for her transprt and medical care. She is making good progress. We wish her a speedy recovery. Assistance was also given to a family whose child died of diabetes in Naguru Hospital Kampala. . 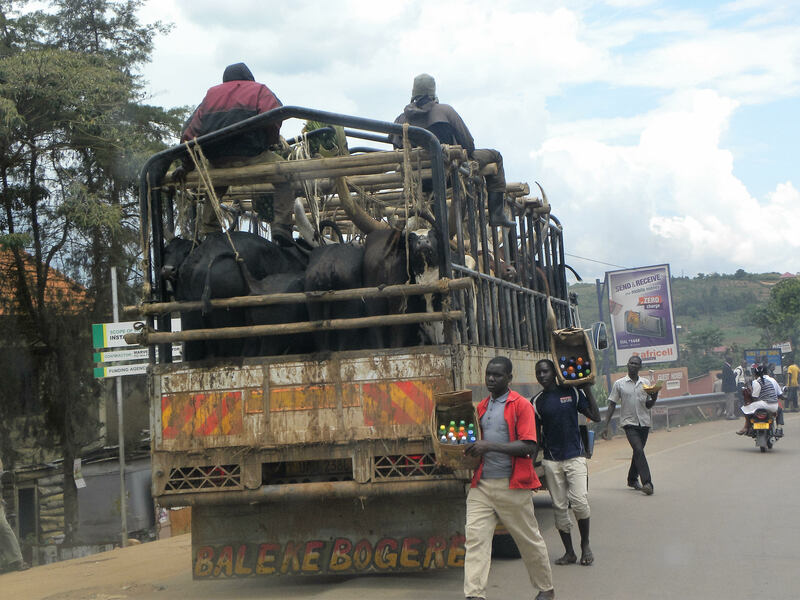 The family couldn't afford the transport to bring the body back to rest in Rukiga. The community came together and raised funds towards some of the cost of transport, the rest was covered by the Emergency Fund. This ensured that the burial proceeded smoothly for the family who have thanked CLICK Rukiga for their continued support. We at CLICK Rukiga would like to thank the people of Ickenham for their continued support in ensuring this valuable work continues to flourish. 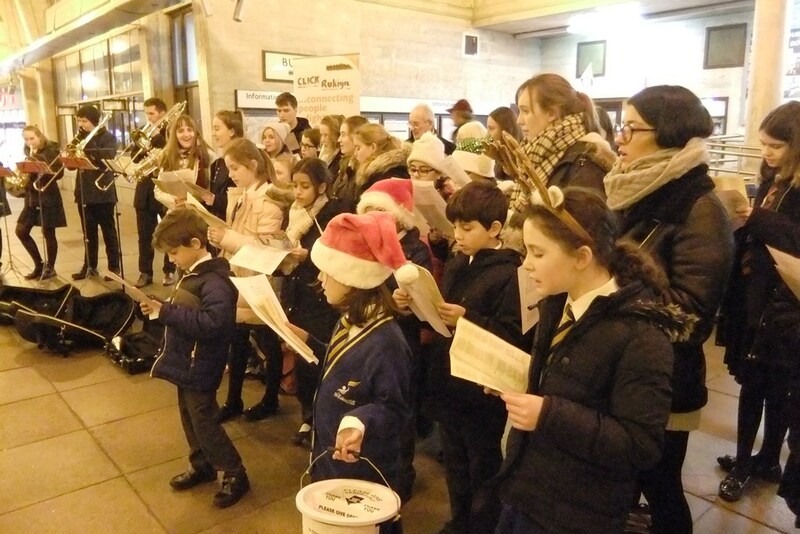 One late afternoon in early December, about twenty students and staff from Vyners School, were joined by members of the Ickenham community for a two hour carol singing event in Uxbridge Station. The Carol singers were accompanied by a brass quintet which was so well recieved by shoppers and commuters that a record £535.79 was raised for Rukiga. Everyone thoroughly enjoyed singing and playing. Many commuters stopped to watch, film and even join in with the carols. The Visit to Uganda was scheduled as a monitoring visit to check out all parts of the program by the Committee Members. 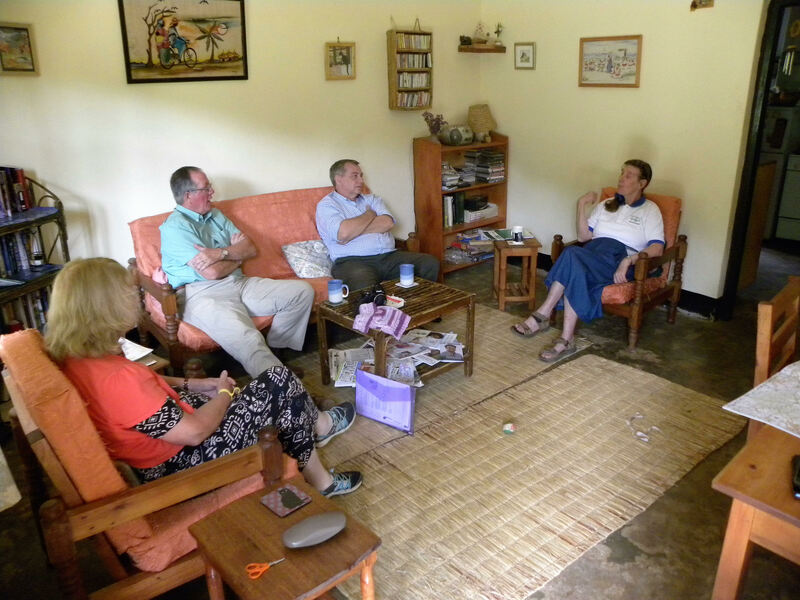 Shirley Gledhill, Mike Whitlam, Derek Hughes together with Mark Morrish arrived in Rukiga on Friday, 4th November. 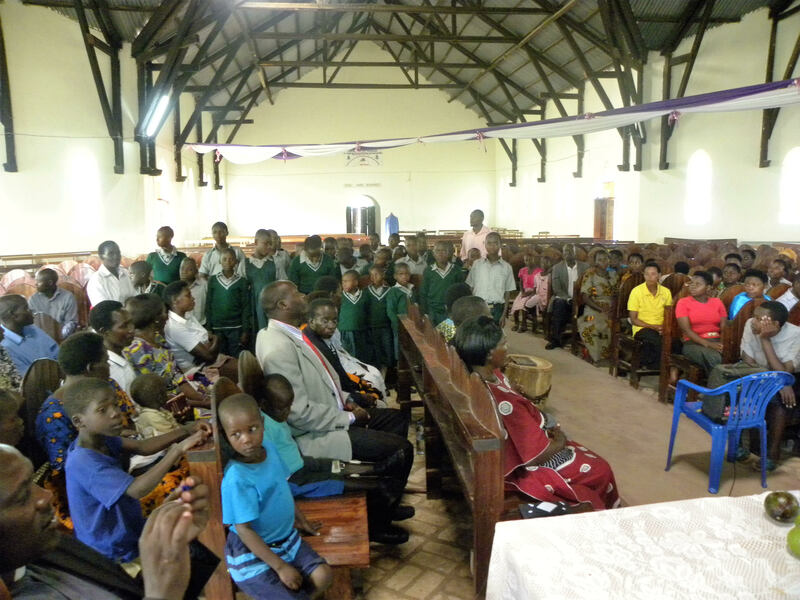 The first weekend was spent visiting Sponsored children and their families along with a visit to Saint James' Church on both Saturday and Sunday, in order to meet all the Sponsored children, discuss the detail of the program with Hillary Turyakira, and attend the Sunday Service where Mike preached the Sermon. Mike Whitlam reported, "we agreed to take a further 10 children and find sponsors for them. We also agreed with the new priest the Venerable Ernest, that we would visit Kamwezi Primary and Kamwezi Secondary schools, as they have a link with Saint James' Church". This was a successful visit, where they also agreed to help Hillary by trying to fund part of the new youth program which he is developing. Mike continues, "on Monday we were able to have a brief meeting with the Head teacher, Peter, at Kamwezi Parents School. The meeting was brief as the children were taking exams and also Alex Coulter had visited with children from Vyners' School in July. We spent time discussing the Pixel programme which is being developed by Vyners' and Kamwezi Parents School jointly. Again a very successful visit." 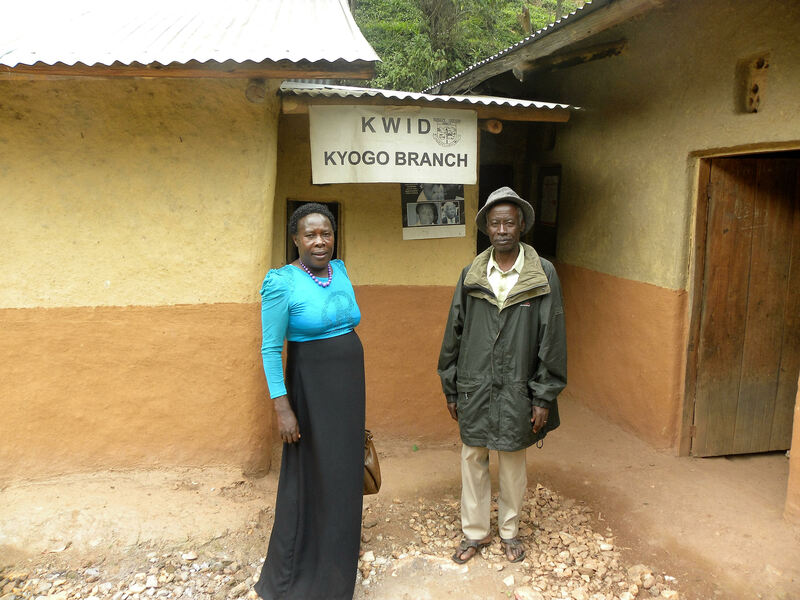 Tuesday and Wednesday was spent at the KWID Headquarters in Kabale discussing aspects of the program that CLICK Rukiga had supported. This particularly included the development of the plot of land that they had helped them purchase. According to Mike, they went to see it and to see the success that has been made of growing food for the local community. The next large project is to build a community centre on a small part of that land. This was discussed at length and agreed to explore further back in Ickenham. There was also an enormous celebration of the 20th year in existence. Mike and the team were guests of honour and had a thoroughly enjoyable time. Wednesday was spent visiting the Brain Trust School. This school is linked with Breakspear Junior School. 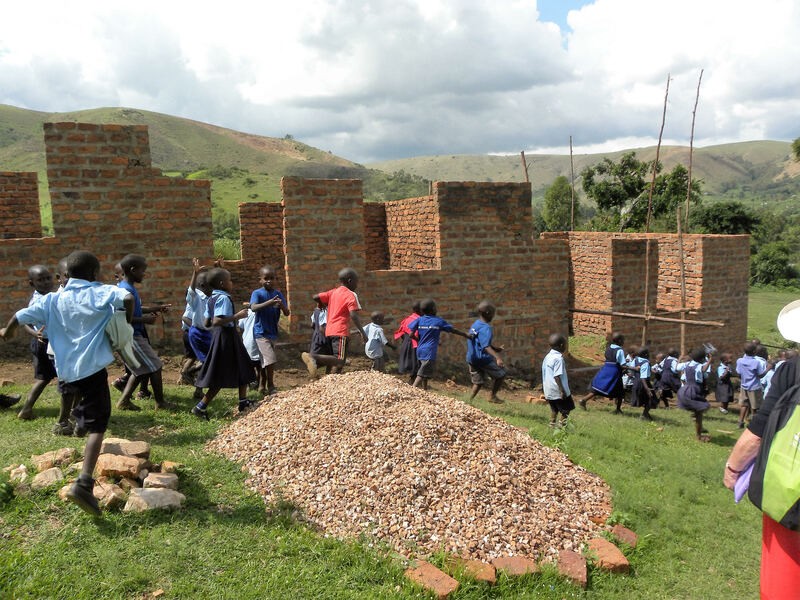 "We were able to see how the funds that we had sent to them were being used to build new classrooms. We discussed at length the next plases of development and how we could help", stated Mike. There were also discussions about the water programs. Derek and Mark took quite a long time visiting the water development programme and had a meeting with the local Water Committee. Plans are being developed and discussed to improve the water situation in the locality. Thursday was spent visiting Ann Moore, a nurse in Kigezi Hospital, whom we sponsor from Saint Giles Church through the Church Mission Society. Mike went on to state, "Again we were able to visit a number of areas in the hospital and see the incredible work being done by Ann and her colleagues. 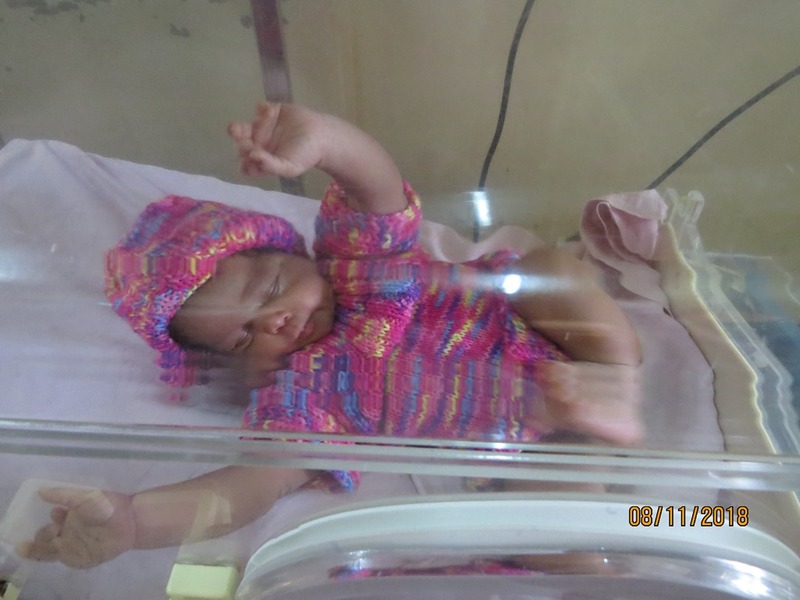 Time was also spent visiting the new nursing school which is linked to the hospital." 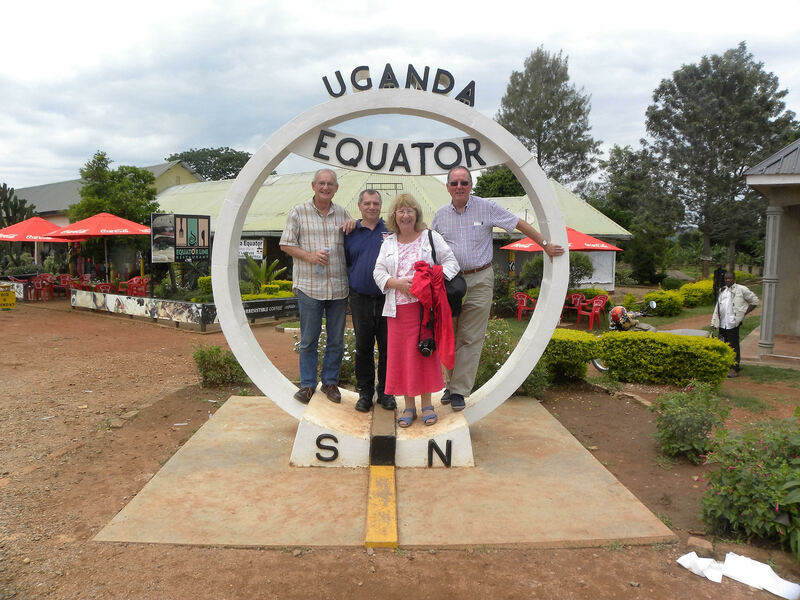 Friday 11th November, arrived too quickly as the team prepared for the long journey back to Entebbe, so that they could fly back to London on Saturday. 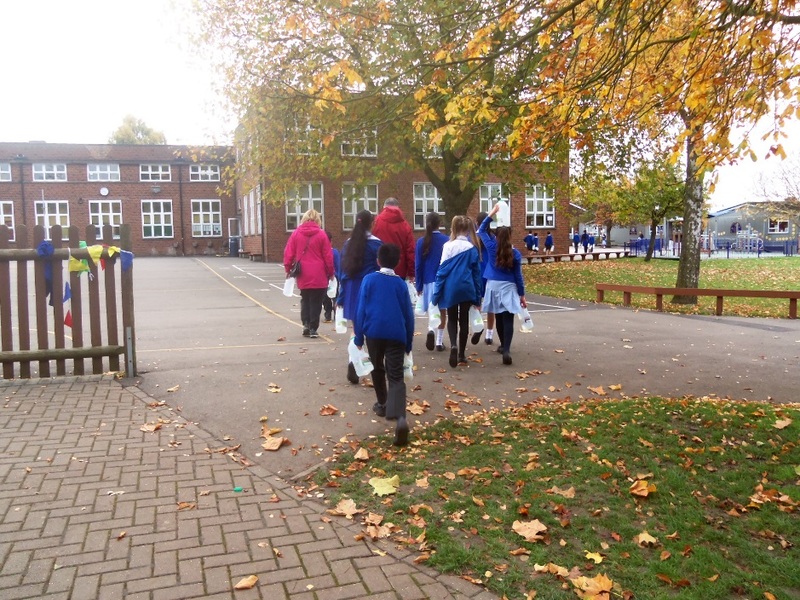 Since arriving back in Ickenham discussions are in place for the next phases of the program including a new link between Kamwezi Primary School and Saint Matthew's Primary school in Yiewsley. This underscores the importance of supporting education in rural Uganda and the need to reduce the odds of students achieving their educational dreams. We at CLICK Rukiga were very fortunate to have Jo as a member of our co-ordination team and as a child sponsor. Her love and support for the people in Uganda shone through all the time. She fully understood how best to help them build sustainable lives and was committed to helping one family in particular as they had serious problems to resolve. The messages from our friends in Uganda about Jo, all show that they too will miss her. She made a real difference to people's lives and we will all miss her. Thank you Jo. We give back to you, O God, those whom you gave to us. You did not lose them when you gave them to us, and we do not lose them by their return to you. Your dear Son has taught us that life is eternal and love cannot die. So death is only an horizon and an horizon is only the limit of our sight. Open our eyes to see more clearly, and draw us closer to you that we may know that we are nearer to our loved ones who are with you. You have told us that you are preparing a place for us, prepare us also for that happy place, that where you are we may also be always, O dear Lord of life and death. The Hall of St Giles in Ickenham came alive with the sound of highly exciting, powerful and yet beautiful, revolving rhythms of the ngoma. Seby Ntege and his Ugandan band also played relaxing, soft, melodious sounds with the thumb piano (endongo), the panpipes (enkwanzi), the tube fiddles (endingidi) and the xylophones (amadinda). What a fun and entertaining evening to spend in aid of CLICKRukiga. 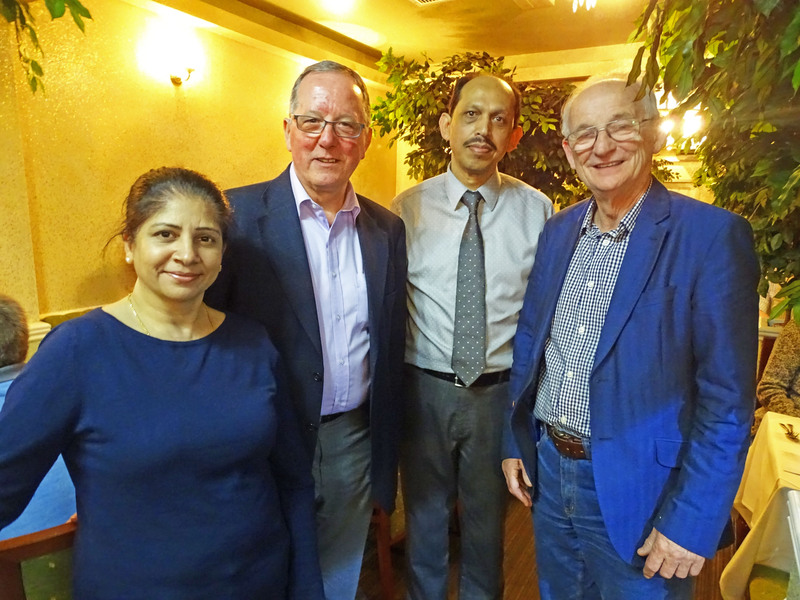 The annual dinner to raise funds for CLICKRukiga was held once again at Ickenham's Birothi restaurant. Members of the Hillingdon Music Service String Quartet played a delightful selectiuon of light classical music throughout the meal. The event raised about £500 which was doubled by Barclays Bank, Ruislip. Alan Johnson MP for Kingston Upon Hull West and Hessle, came to St Giles Church Hall in Ickenham for an evening of answering questions on various issues and current affairs. Mile Whitlam, CLICK Rukiga's founder member and Co-Ordinator, asked some well researched and interesting questions, before it was thrown open to the audience to question Mr Johnson. The audience were spellbound with Mr Johnson's avid story telling recounts of his childhood and his days of working as Minister for the Labour Government. The evening concluded with Alan Johnson signing his books "This Boy" and "Please Mr Postman". The books are humourous, moving, uplifting and told with a dry wit. The evening raised just under £1000 for CLICK Rukiga. A huge thank you to Alan Johnson and the Community of Ickenham for making the evening a success. 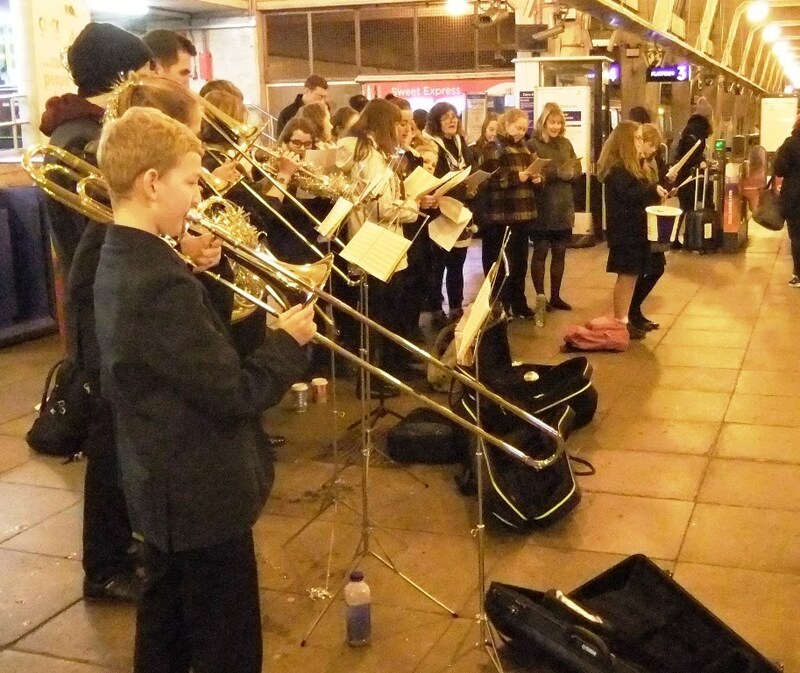 On 7th December 2015, Members of CLICK Rukiga together with students from Vyners school extended some Christmas cheer to the commuters at Uxbridge Station. Fifteen members from churches around Ickenham also took part in the Carol Singing. The students from Vyners School, which included three flautists, were led by their Music teacher Miss Yates. 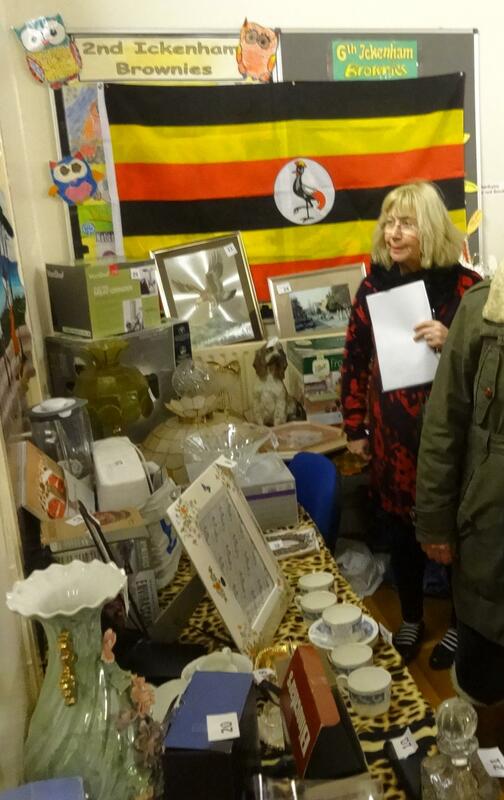 Their festive efforts raised £381 for Rukiga. The Station Master was very helpful and appreciative of the singing. Many commuters stopped to watch, take photos on their phones and also joined in with the singing before giving generously to the Charity. 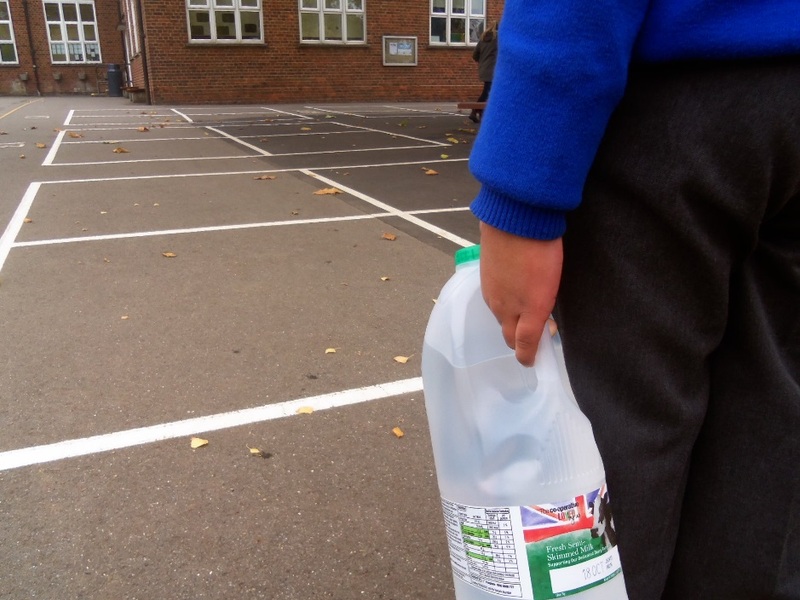 On Friday 23rd October, the children in the local Primary School, walked around the school grounds carrying water containers so they could get a sense of what it is like for children in the Rukiga area in Uganda. 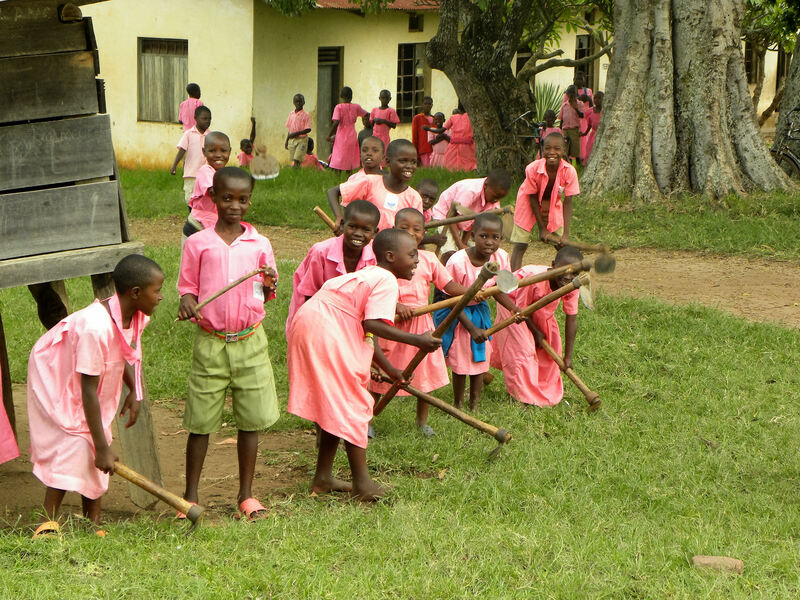 The children in the Rukiga area have to walk for up to half an hour each way from their home to a tap to get clean water. They usually do this before they go to school. 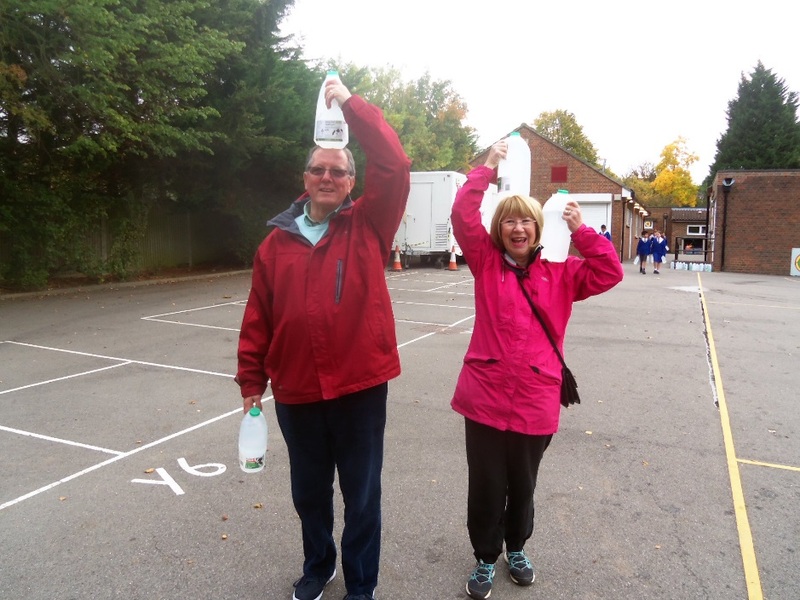 Mike Whitlam, the Charity Founder member and Co-Ordinator together with Shirley Gledhill, Committee member and Child Co-Ordinator, joined 700 children of Breakspear Primary on their walk. 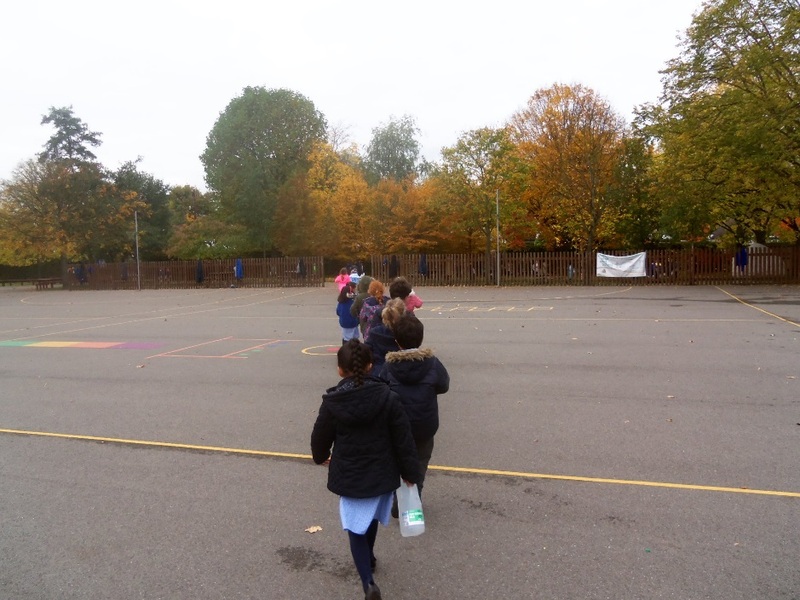 The children went out in year groups carrying two milk bottles, filled with water, each for about fifteen minutes. Just over £4,000 was raised in total, including the money which came in through the Just Giving page. In a word the children were fantastic. Thank you everyone for supporting this worthy cause. Fancy a spot of tea with freshly baked scones loaded with strawberry jam and thick clotted cream? The venue to head to, was the Rectory Gardens complete with indulgent petit fours and endless cups of tea. 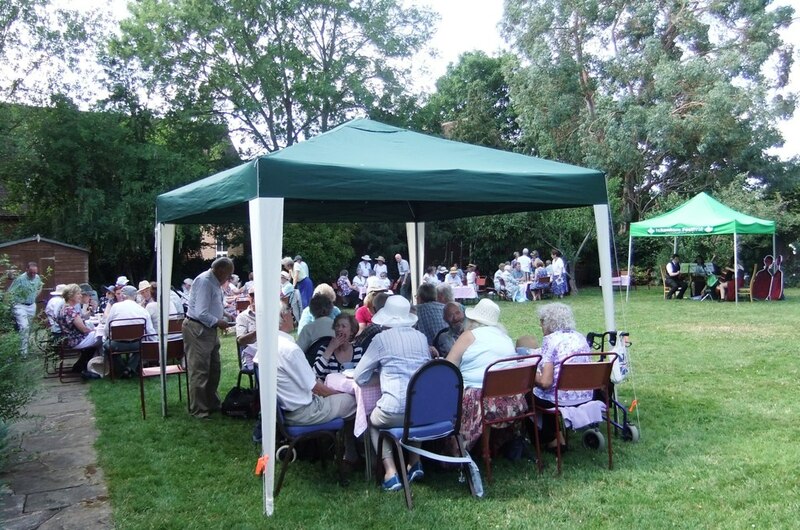 On Saturday, June 14 2015, the CLICK Rukiga team had organised a cream tea afternoon in the Rectory Gardens. 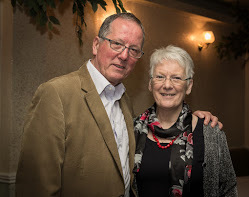 The hostess and host for the afternoon were Rector Felicity Davies and Tony Davies. 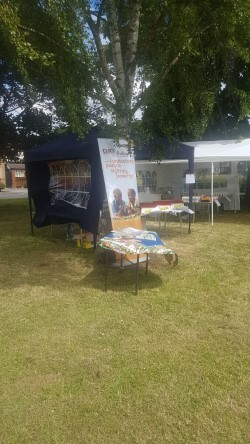 It was a glorious hot and sunny afternoon where the members of the public for a small sum enjoyed a cream tea, scones and home made cakes with a cup of tea while listening to the Hillingdon String Quartet playing classical music. Members of the public were also treated to a well kept lawn and a beautiful, lush garden to enjoy during the break. The event was a success and raised over £800. A huge thanks to all the committee members who helped to organise the event. 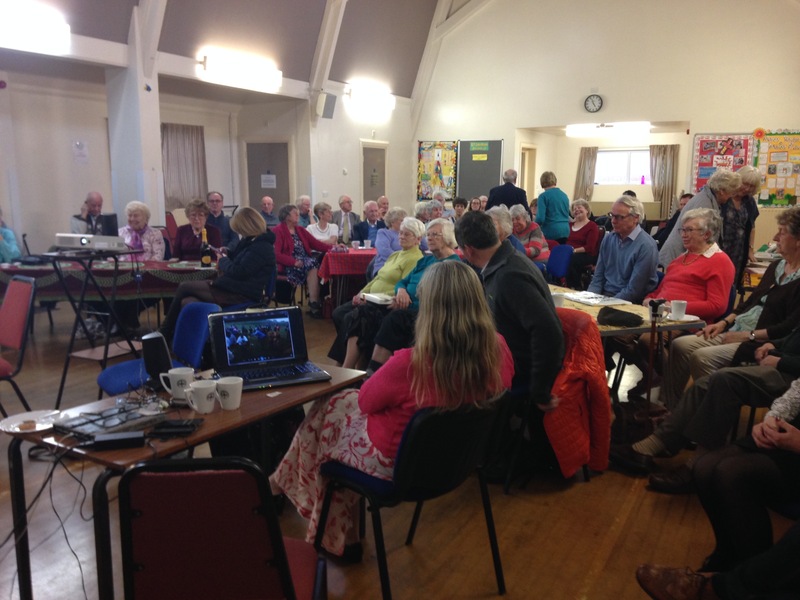 A special thank you to the people of Ickenham, who helped to make this event a success. 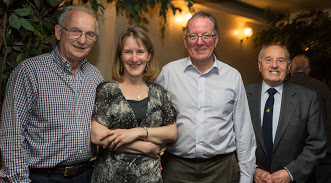 An annual fundraising dinner was held at the Birothi Restaurant in Ickenham on Tuesday, 19th May 2015. The dinner was a real success and was fully booked with 50 people. 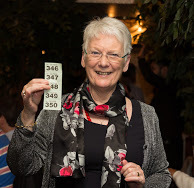 The funds from the dinner and the raffle raised over £700. And if that wasn't exciting enough, live music for the evening was provided by The String Quartet from Hillingdon Music Service, comprising of a group of school students. They played beautifully for the diners enjoying their meal, while Mike Whitlam, the founding member of CLICK Rukiga, was able to update the audience a little about the ongoing project on CLICK Rukiga and especially the sponsored children of which there are 35. The annual dinner not only raises funds but also spreads information about the link with Rukiga. The charity subsequently recieved an unexpected donation of £500! Well done everyone and thank you to the Birothi Restaurant for their help. The food was marvellous. A special thank you to all who made the evening a success. 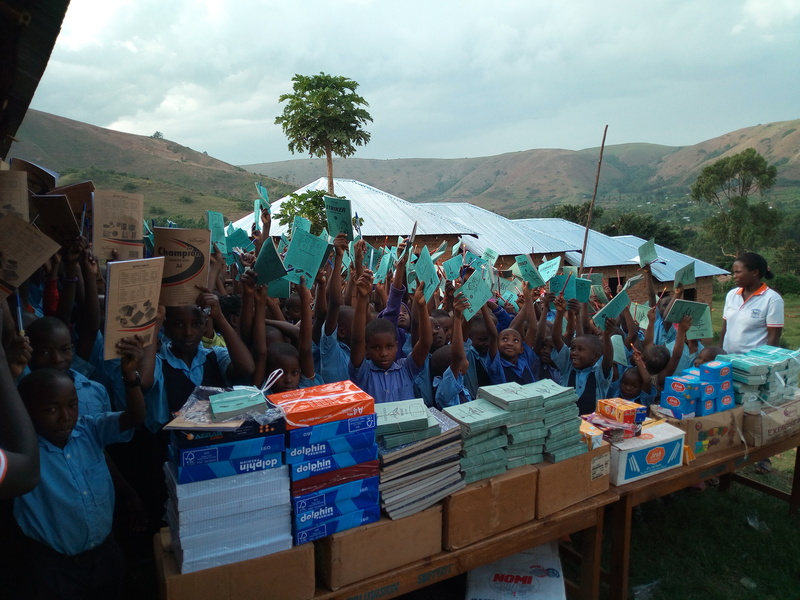 The generous contributiions have a very real impact on the lives of the people in South West Uganda. Some of the CLICK Rukiga committee members. A well deserved photo opportunity for a successful evening. Buying and Selling Raffle Tickets! 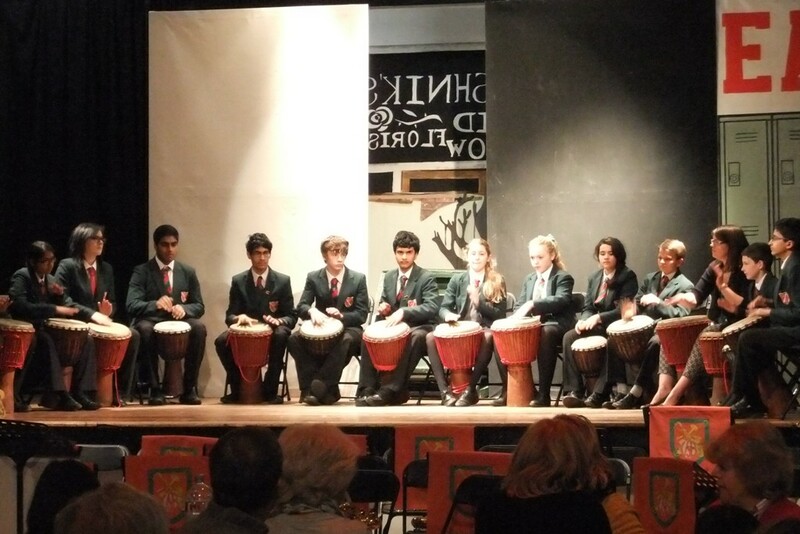 A concert in aid of Click Rukiga was held at Vyners School on Friday 30th January at 7.30 pm. 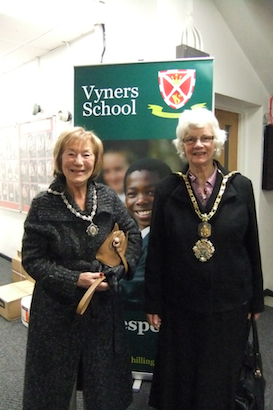 The school hall quickly filled up with friends and families of Vyners School. Their excellencies the Mayoresses graced the occasion with their presence. The evening started with a piece that involved the drums being played by the school band. The swing band did a marvellous job in entertaining the audience. 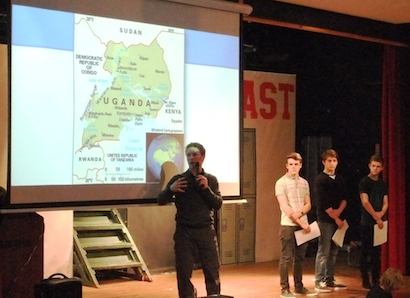 After a short break some of the students of Vyners School gave an informative talk about their visit to Uganda last summer. 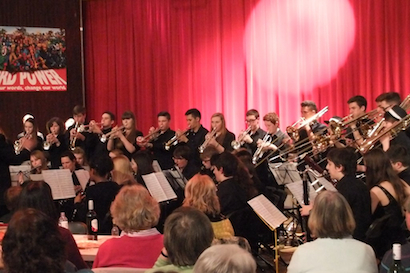 The Hillingdon Music Service Concert Band entertained the audience in the second half of the evening. They skilfully played exerpts from Les Miserables, Robin Hood, Hokey Carmichael in concert, Lion King, Jersey Boys and Chicago. There was no doubt that some very talented were people involved during the evening, producing some fine moments. The experience was overwhelmingly uplifting. A huge thank you to all those who took part in making the evening a success. 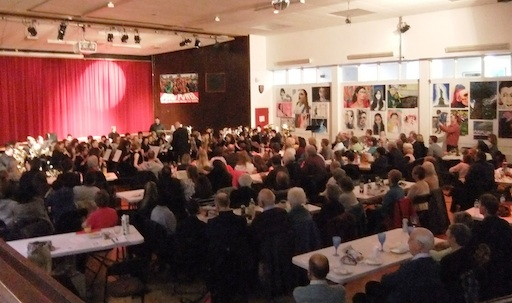 A special thank you to AVK eyecare of Ickenham who sponsored the concert. The event raised over £1500. 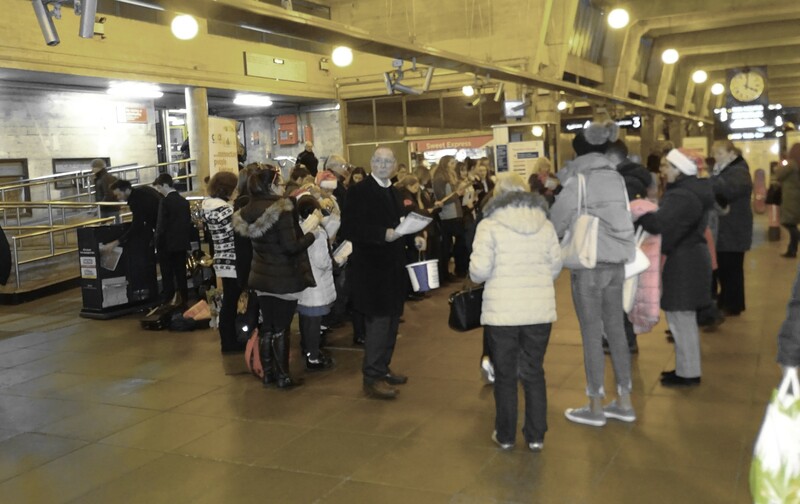 On Wednesday evening, 3rd December, between 5 - 6.30 pm, Uxbridge Station came alive with the sounds of carols from the team at CLICK Rukiga and Viners School students and teachers. 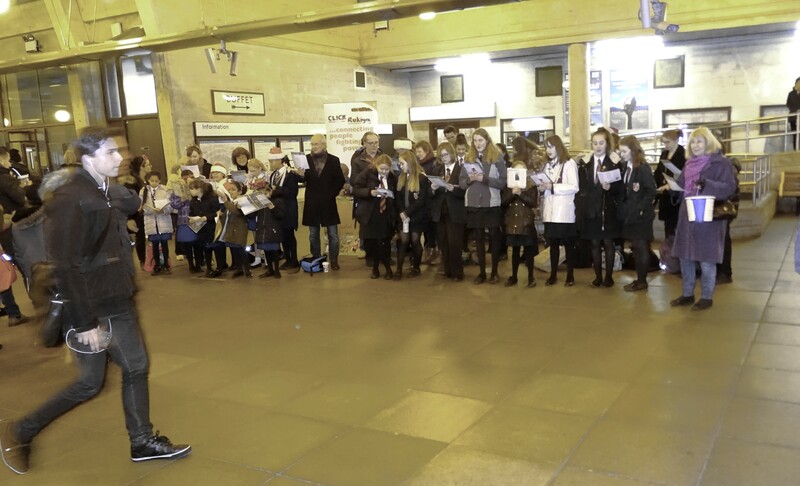 Commuters were able to enjoy the carols while hurrying to and fro from the station. Others stopped and took pictures. An evening of Christmas Carols is a surefire way to sprinkle some holiday spirit into the season. We came away from the experience with a warm glow. Through the commuters and the general public's generosity, £313 was collected for the charity. 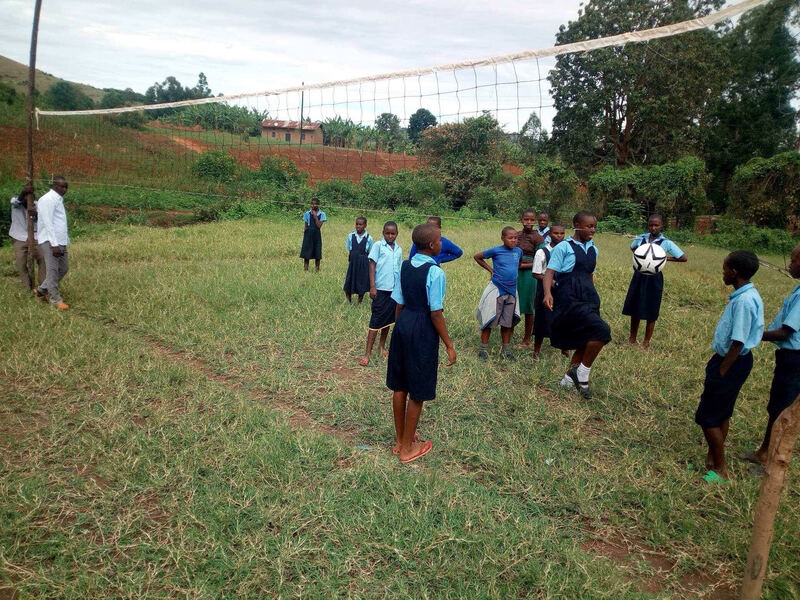 Thanks to all the team at Click Rukiga for organising the event as well as Viners School, which exemplified what can be achieved when the community combines forces in the spirit of good will. 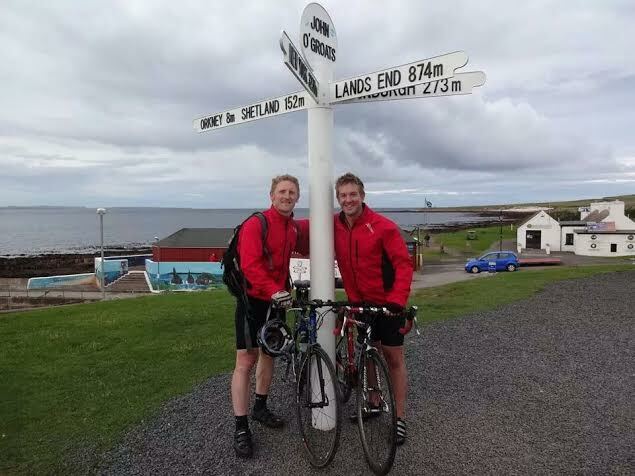 Alex Coulter and Geoff Slade from Vyners School cycled from Land's End, Cornwall to John O'Groats, Scotland covering a distance of approximately 1000 miles in 10 days to raise funds for CLICK Rukiga. They set off on 7th August from Land's End and completed their journey on 17th August. A big thank you to the generous donors. To date, £1500 has been collected. All donations also recieve Gift Aid. Check out our Fund Raising page to discover how much money, the above event helped to raise. 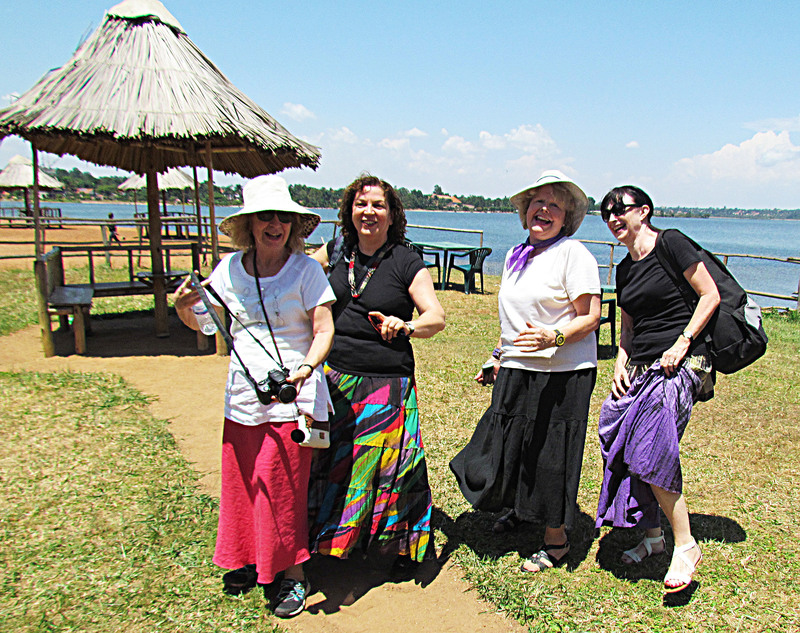 A party of eleven of us visited Rukiga in February this year. This visit differed somewhat from previous visits as this time we were wanting to foster our social connections. However we were able to see how our fund raising had been put into effect but we were not there specifically to plan future projects. We were able to visit Sister Ann Moore who has worked in the Rukiga area of Uganda at the Kisizzi Hospital for the last 18 years. We were fortunate to visit both Kamwezi Parents School and the Brains Trust Primary School. At both of these venues we were entertained with lively and energetic singing and dancing. Our visit would not have been the same without a visit to see Kabale Women In Development run by Florence a lady of immense vision and drive. Their mission statement is "Empowering women and other vulnerable persons to address hindrances to their achievement" We visited three of the six centres she has set up. Another very important aspect of this trip was to attend the Sunday service at St James Church. Our party was greeted by Esau the vicar, and his wife Joyce. After a very uplifting service, lunch was served and then our group split up to visit various of the sponsored children. Hillary from St James is the main organiser for the sponsorship whilst Shirley is ours. We also had a wonderful boat trip on Lake Bonyonyi. Another major highlight was the visit to Queen Elizabeth Game Park where we saw an amazing amount of birds and wildlife. Towards the end of the visit we stayed a couple of days in Kampala. On our way to the airport we were able to visit the Entebbe Botanical Gardens, a very beautiful place nestling beside Lake Victoria.